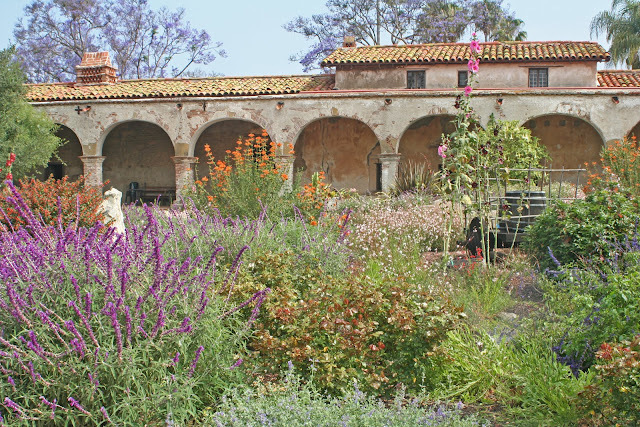 It's not like I've never been to any of the California missions before, but I seem to have a renewed interest in the early history of our state, in particular, that era before California was even a state. Hopefully one of the more desirable symptoms of getting older (and therefore more obsessed with the notion of antiquity). Gil & I have been to the Santa Barbara mission a couple times over the past 10 years, and have been to Mission San Juan Capistrano once almost 20 years ago. I enjoyed those visits, but that's about all I can say or recall of those bygone times. 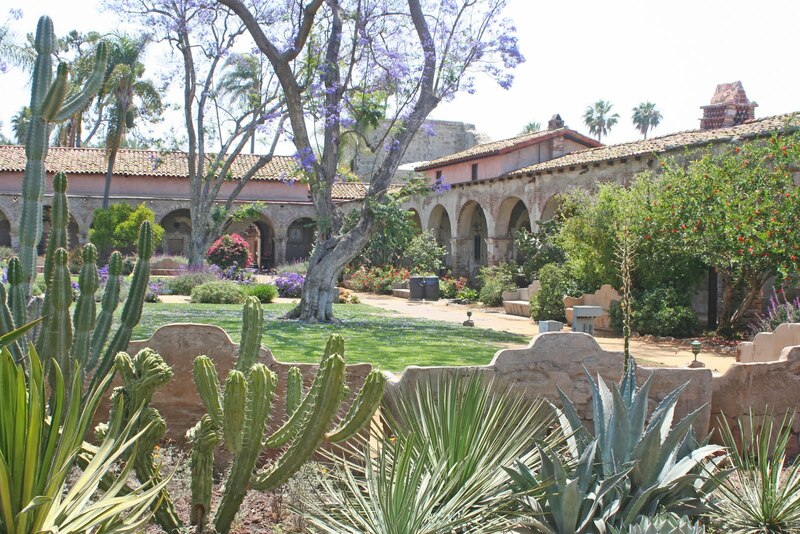 With this week off for my summer vacation, and Gil only free for a couple days in the mix, I thought it would be fun for a relaxing day trip to revisit the Mission at San Juan Capistrano. So that we did yesterday and all I can say is that it was really an amazing, fantastic experience. Wonder why I didn't think that the first time around? Well, I can answer that question. Back in the day, I simply was not the gardening fanatic that I am now. 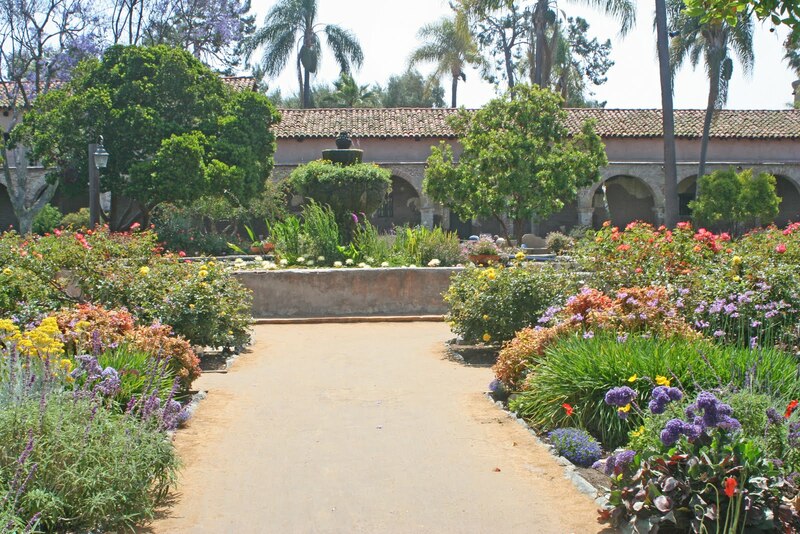 And who wouldn't go totally apey/gaga over the gardens at this mission?! The mission at San Juan Capistrano was founded on November 1, 1776 by Junipero Serra, a Franciscan friar, born in Majorca, Spain in 1713, who made his way to Mexico, Baja California, and then Alta California to establish 9 of 21 missions over the course of 54 years. 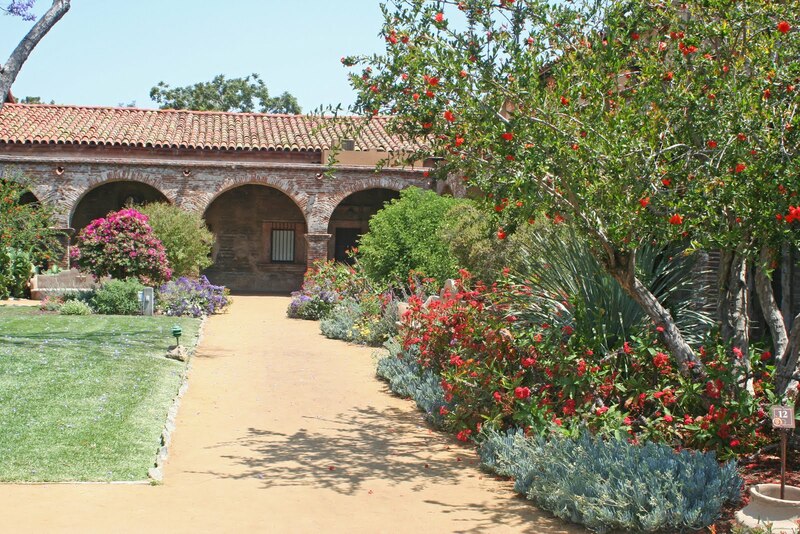 These missions span from San Diego all the way north to Sonoma. 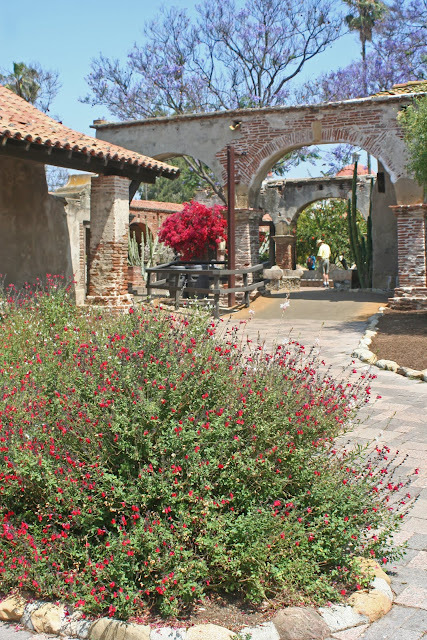 Interesting factoid: in 1783, Mission San Juan Capistrano produced the first ever California wine from the Criolla or Mission grapes that had been planted on the grounds in 1779. So here we are today (or rather yesterday). We joined a free tour of the gardens at Mission San Juan Capistrano with a docent, a lovely lady, originally from England with great accent and matching sense of humor. 6/30/10 Front Garden. Clockwise, left to right: Bird of Paradise (Strelitzia reginae), Roses, Geranium (potted), and Statice (Limonium perezii). 6/30/10 Front Garden. Birds of Paradise (Strelitzia reginae). Mind you, most of these plantings are not original to the mission, but were lovingly planned & installed by a volunteer group of devotees, who wanted to bring some joie de vivre back to the grounds which had kind of gone to the weeds after years of neglect. They've done an amazing job! 6/30/10 Front Garden. 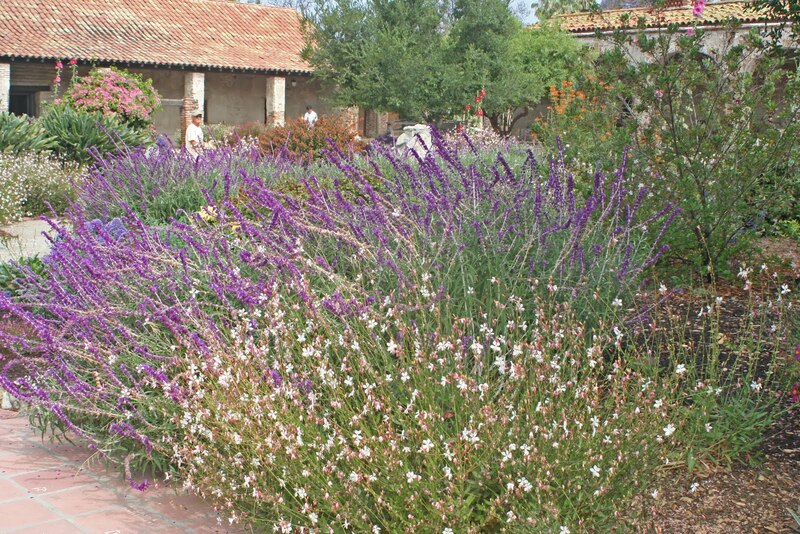 Mexican Bush Sage (Salvia leucantha) & Wand flower (Gaura lindheimeri). 6/30/10 Raised pond in Front Garden. 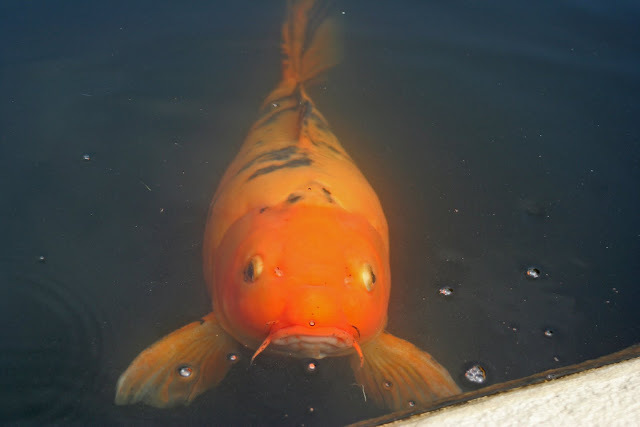 Koi in reverse-cross-eyed mode. 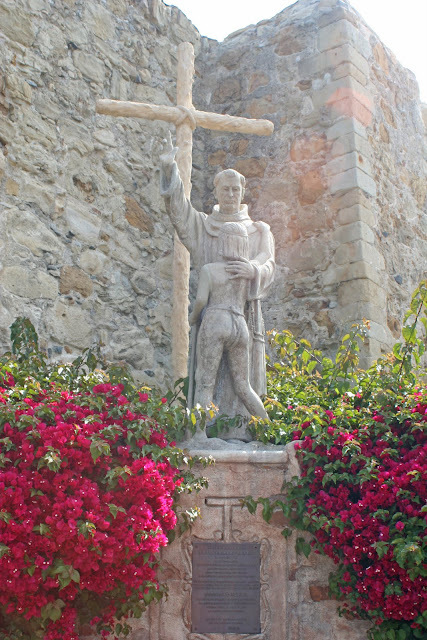 6/30/10 Bougainvillea around statue of Fray Serra in front of the ruins of the Great Stone Church, which was mostly destroyed by an earthquake on December 8, 1812. 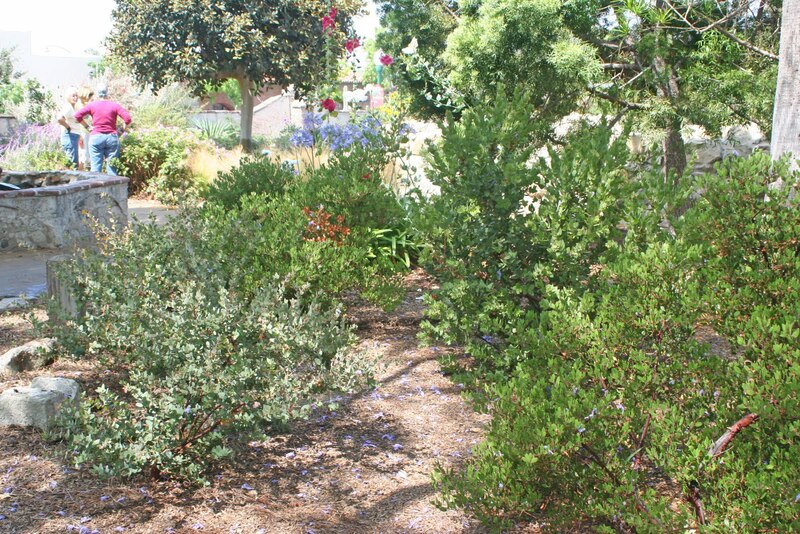 6/30/10 Front Garden. Mexican Bush Sage (Salvia leucantha), Lion's Tail (Leonotis spp. ), Hollyhocks (Alcea rosea). 6/30/10 Front Garden. Manzanitas (Arctostaphylos spp.). 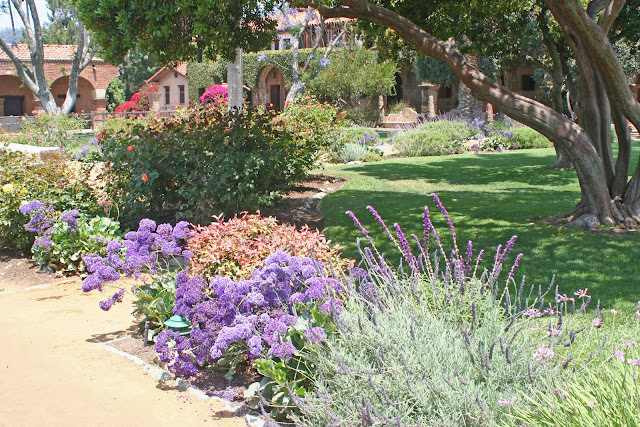 6/30/10 Central Courtyard. 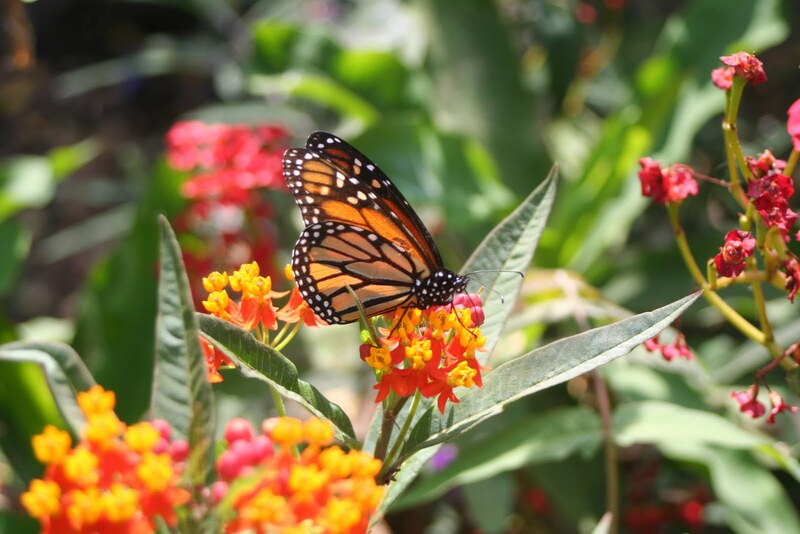 Monarch Butterfly on Milkweed (Asclepias curassavica). 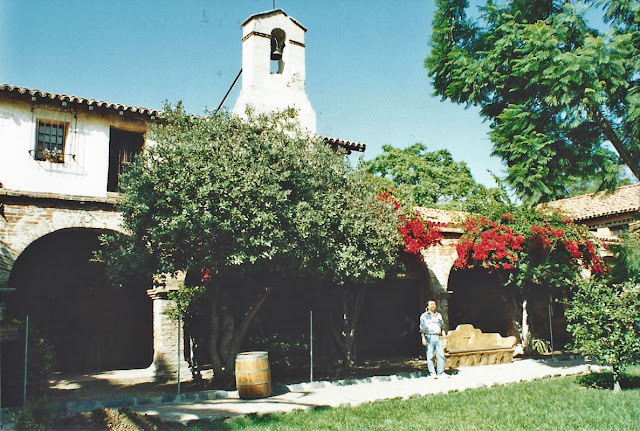 6/30/10 Central Courtyard. Jacaranda Trees in full lavender-hued bloom (Jacaranda mimosifolia). 6/30/10 Central Courtyard. Strawberry Tree (Arbutus unedo). 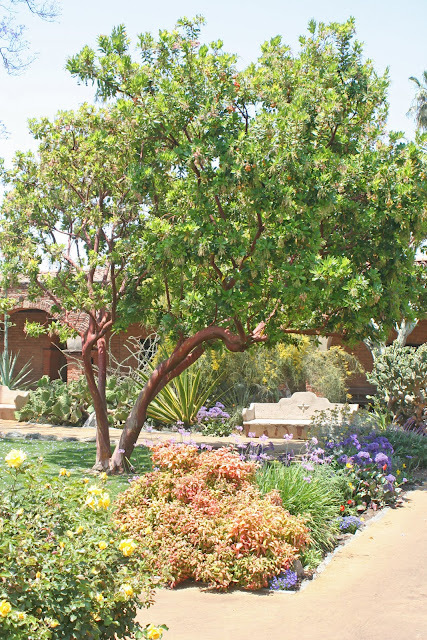 6/30/10 Bougainvillea & Jacaranda Trees. 6/30/10 Statice (Limonium perezii). Central Courtyard. 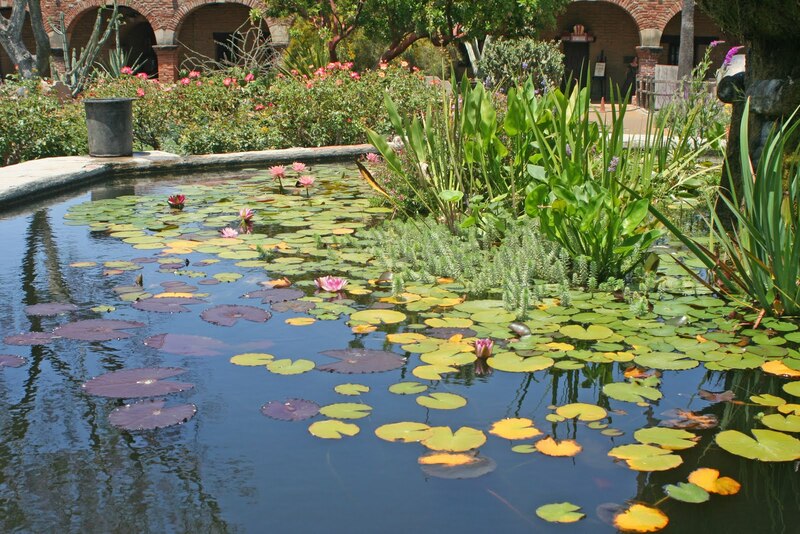 6/30/10 Raised Pond in Central Courtyard. 6/30/10 View of Central Courtyard from Desert Garden. 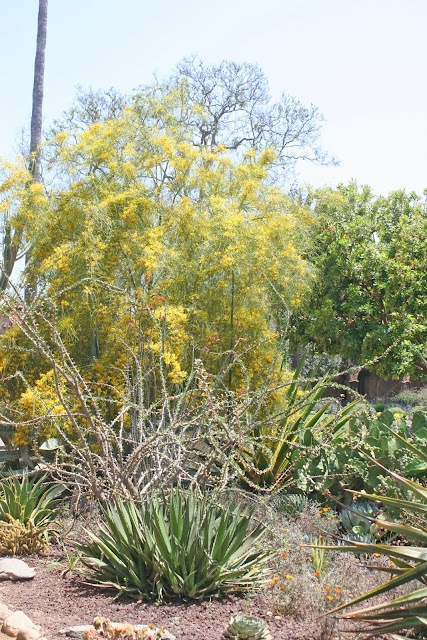 6/30/10 Mexican Palo Verde (Parkinsonia aculeata). 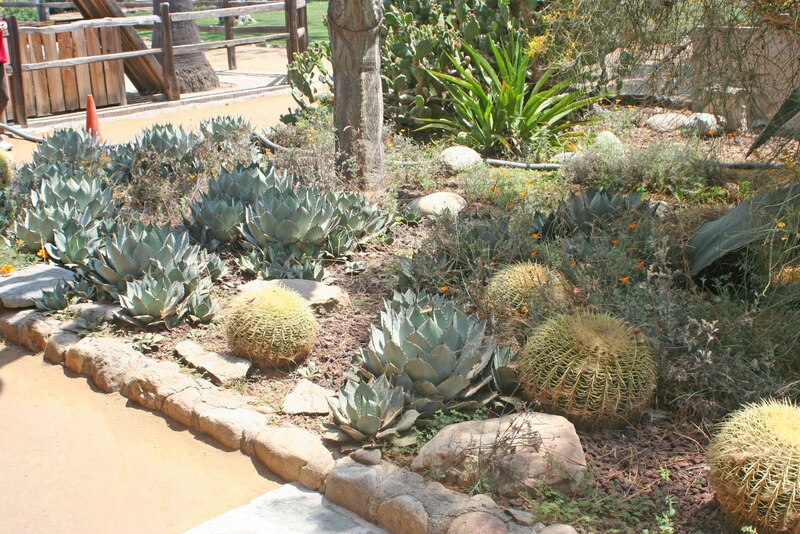 Desert Garden. 6/30/10 Barrel Cactus (Echinocactus grusonii) and Parry's Agave (Agave parryi). Desert Garden. 6/30/10 Dasylirion spp. Central Courtyard. 6/30/10 Autumn Sage (Salvia greggii). 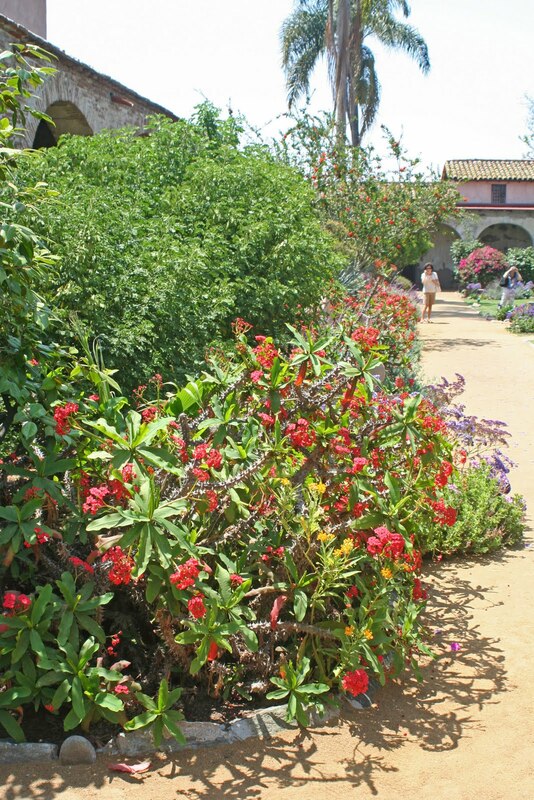 6/30/10 Crown of Thorns (Euphorbia milli). Central Courtyard. 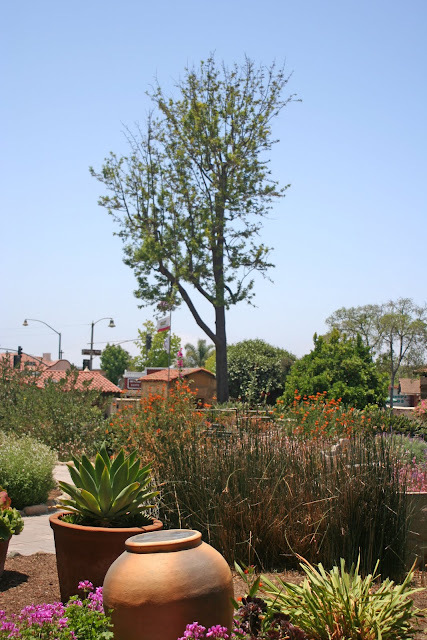 6/30/10 Silk Oak (Grevillea robusta). 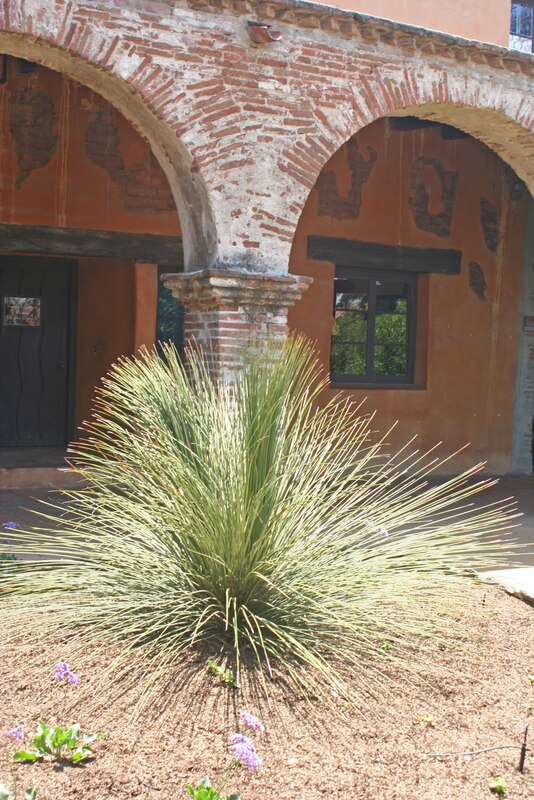 Tallest tree at the mission. But now I'm revved up for a new mission. Got to see all the California missions sometime in my lifetime. Fuggedabout the "1000 Places to See Before You Die" thing. You really only need 21. Here are some pics of our first visit to Mission SJC was in 1992. The Great Stone Church was under seismic retrofitting at the time, hence the scaffolding. 9/7/1992 Great Stone Church. 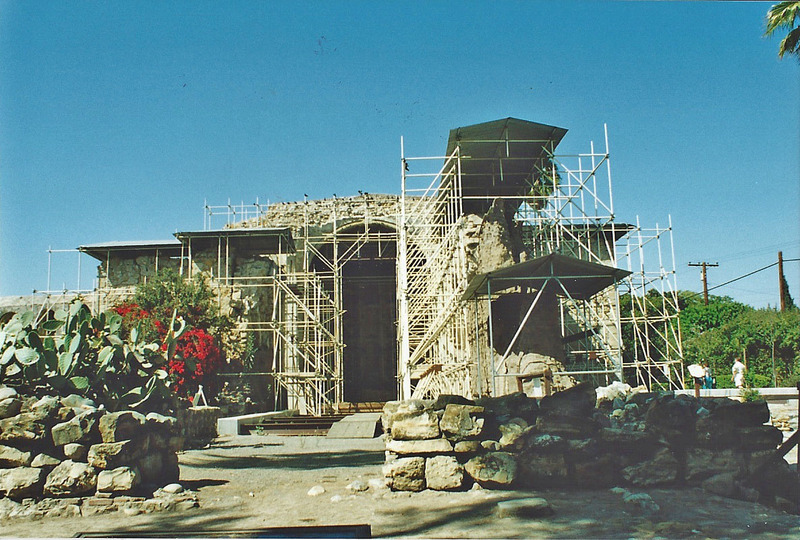 Work on seismic retrofitting and preservation began in 1989 and was not completed until 2004 at a cost of $9.6 million. 9/7/1992 Gil at the entry. 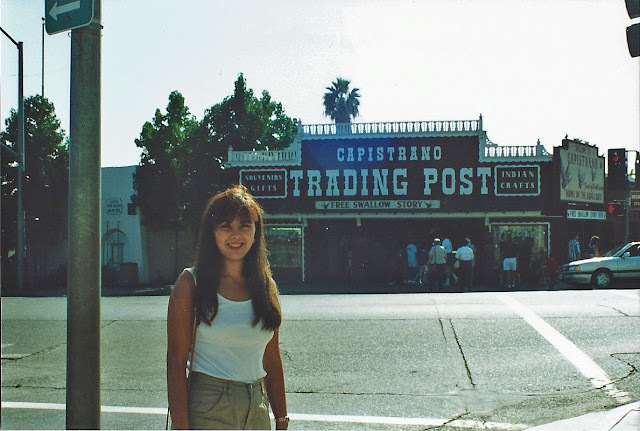 9/7/1992 Street view from the entry to the mission. Hours: Open daily 8:30am-5pm (closed Thanksgiving & Christmas Day). Closed noon Good Friday and Christmas Eve. Admission Fees: $9 for adults, $8 for seniors, $5 for children ages 4-11, free under age 3. San Juan Capistrano is the 7th of 21 California Missions. Indians Joining the Mission: The Takic speaking people of the Acjachemen villages. 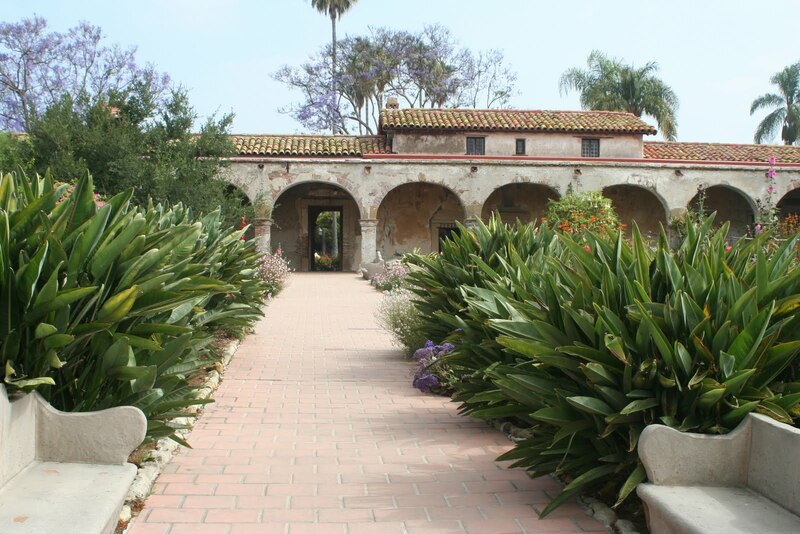 Neophytes associated with San Juan Capistrano have been called Juaneno since the Spanish occupation. Mission Site: Located within sight of the ocean in the town of San Juan Capistrano, which developed around the mission. 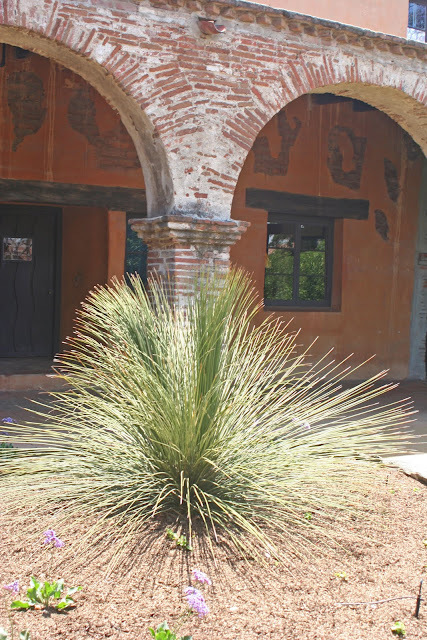 Water Source: Three streams, the Trabuco, Horno and San Juan, converged at the mission. Population: This mission grew steadily, exceeding 1,000 neophytes by 1797. Highest recorded population was 1,361 in 1812. 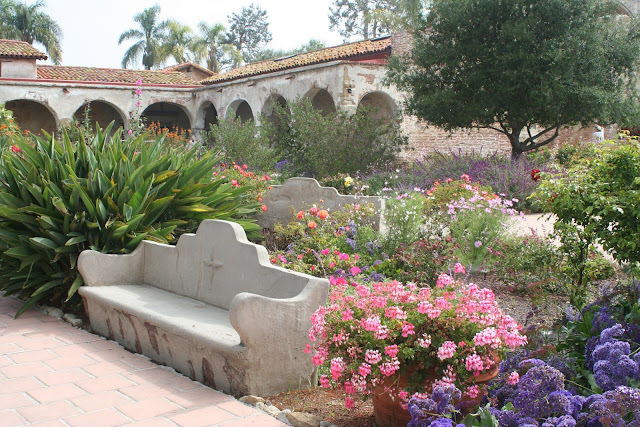 Even in 1833, when the mission was secularized, 861 neophytes were still living at San Juan Capistrano. Livestock: In 1783 (the first year for which we have detailed records) the mission had 430 cattle, 305 sheep, 830 goats, 40 pigs, 32 horses and 1 mule, a total of 1,648 animals. In 1819 (the peak year) the mission had over 31,000 animals including 14,000 cattle and 16,000 sheep. Agricultural Output: Agricultural production was significant. 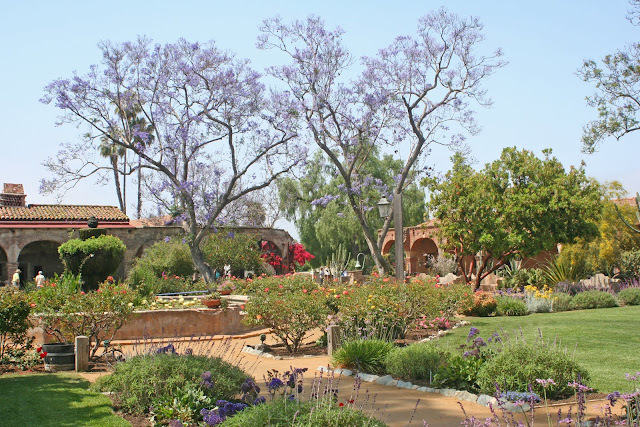 Over the years 1783 - 1831 San Juan Capistrano harvested 234,879 bushels of wheat, barley, corn, beans, peas, lentils, garbanzos and habas (broad beans). 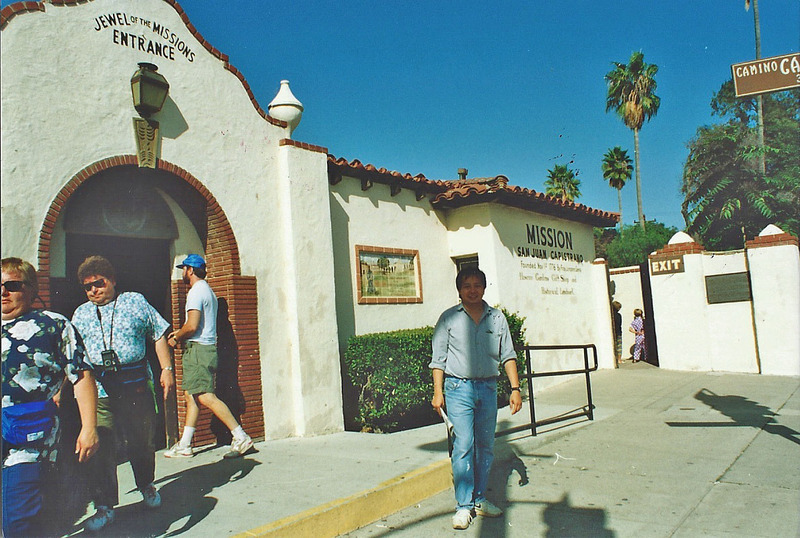 Mission Church: In 1778, two years after the mission was moved to the present site, a small adobe chapel was built, and soon replaced by the Serra Chapel in 1782. This is the only remaining church in which Fr. Serra held mass. 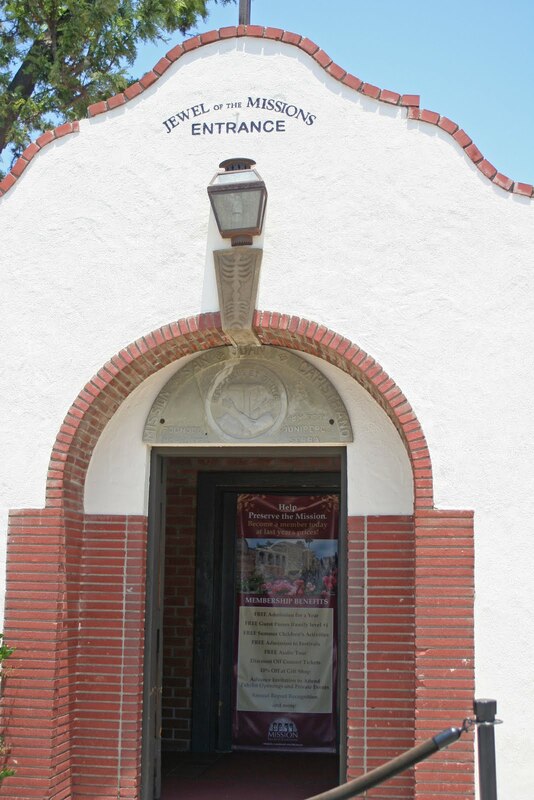 In order to accommodate the mission's growing population, the Great Stone Church was constructed between 1797-1806. This cathedral-like building was 180 feet long by 40 feet wide, and had a high-vaulted ceiling surmounted by seven domes fronted by a 120 foot tall bell tower. In December 1812 a massive earthquake destroyed the Great Stone Church, killing 40 neophytes. Mission Bells: The four bells that hung in the Great Stone Church survived the earthquake, and were hung in a bell wall one of the mission's most picturesque features. The two largest bells were cast in 1796, the others in 1804. Recently the two largest bells were recast, and the originals rehung in the ruins of the Great Stone Church. Mission Art: The reredos and altar of Serra's Chapel are made of cherry wood and covered with gold leaf. They originated in Barcelona, Spain and are about 300 years old. The altar is adorned with 52 angels faces, one for every Sunday of the year. 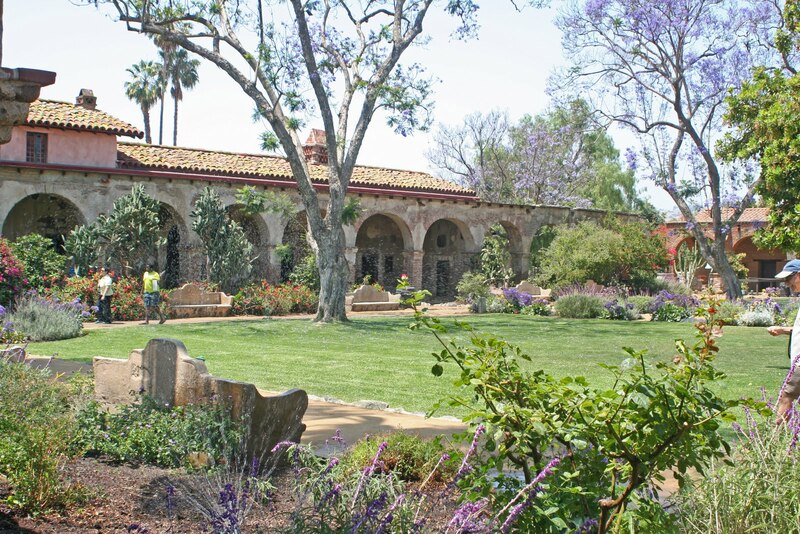 Special Attraction: San Juan Capistrano, with its beautifully landscaped grounds and with the ruins of the Great Stone Church and adjacent bell wall, is one of the most picturesque sites in California. Significant Event: Hippolyte de Bouchard, an Argentine privateer, attacked the mission in 1818. Year Returned to Catholic Church: 1865 in a decree signed by Abraham Lincoln. Current Status: The Mission San Juan Capistrano Basilica (a large modern church) and the Serra Chapel are part of the Catholic Parish of San Juan Capistrano. Interesting Facts: Cliff Swallows (Las Golondrinas) return to mission from their wintering grounds 2,000 miles away on or about March 19 (St. Joseph's Day). The return of the swallows is celebrated in Leon Rene's famous song "When the Swallows Come Back to Capistrano." 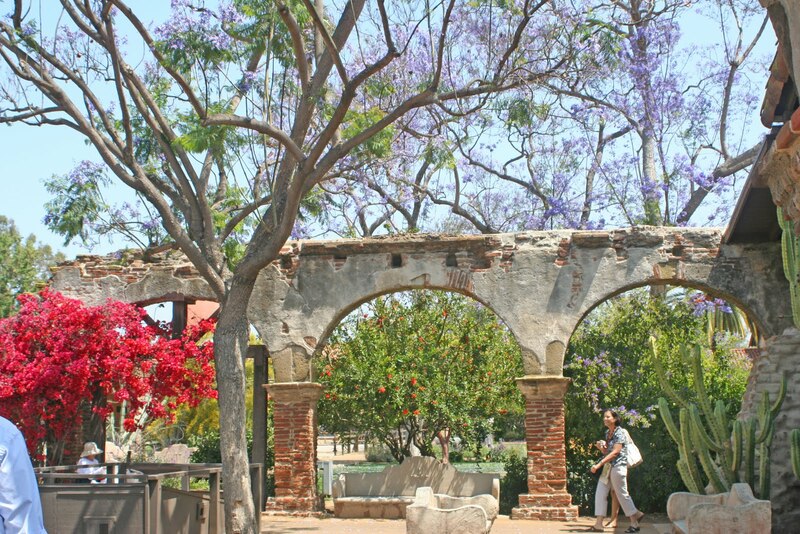 San Juan Capistrano was actually founded twice. 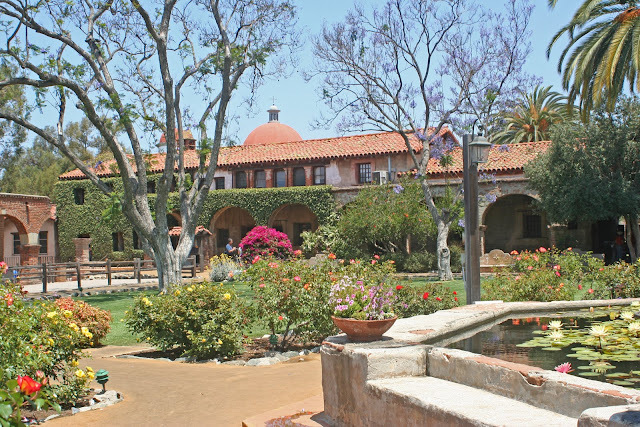 Construction begun in 1775 when news of the Indian attack on the San Diego mission forced the padres to stop construction and delay the founding until late 1776.